When I was growing up, many people told me that if I wanted to pursue music, moving to Los Angeles was the only course of action. 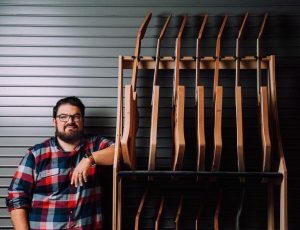 As I grew older and pursued a full-time career in the guitar industry, I started to realize that Northern California also has its share of amazing guitar-related companies, from pickup builders to repair shops to even large-scale companies. 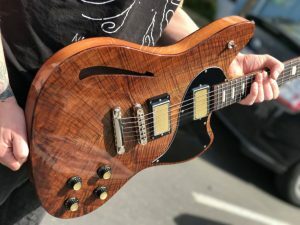 On one such occasion in August of 2016, I had the opportunity to take a tour of the Kauer Guitar HQ, where Doug Kauer makes some of the coolest boutique guitars on the market. In an industry dominated by aspiring luthiers, I found Doug’s designs to be a breath of fresh air amongst his competitors. 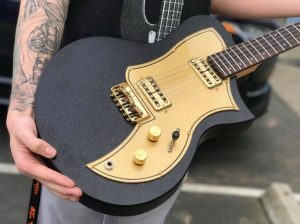 Having just built my first electric guitar out of parts, I also thought it best to see how independent luthiers take their love of the craft to the next level and start producing on a larger scale. Doug recently had some time to answer my questions about Kauer and his work behind the scenes. What is the name of your shop / guitar company? Kauer Guitars and Titan Guitars (we build both lines). Why did you get into guitar building? I kind of fell into it honestly. I grew up working in the family cabinet business so working with my hands, doing woodworking and designing things was all I did growing up. I always enjoyed it and I have a weirdly strong passion for people who physically make things (anything like guitars, watches, airplanes, trains, jewelry etc.). I started playing guitar in junior high, self-taught after realizing that the “we will get you guitar lessons if you get good grades” offer my parents made wasn’t worth the effort! I always tinkered with everything including my guitars, but it wasn’t till much later that I decided to try making one. Even though I had the background and mechanical skills, something about guitars still seemed mythical to me. Then one day I realized that someone makes a guitar, why can’t I? The seed was planted. This nice piece of maple came in the shop and that was the final straw, I decided to try it. That first guitar is still here in the shop, unassembled and robbed for parts to make the next one… and the next one and so on. The main encouragement I got outside of my spouse and family that I was on the right path was from other luthiers, notably Nik Huber. I didn’t know there was a boutique guitar community when I started building for fun. Nik and so many people went out of their way to encourage and share insight into both the art and business that I’m always going to be indebted to them. Something I do my best to pass on to the next wave. 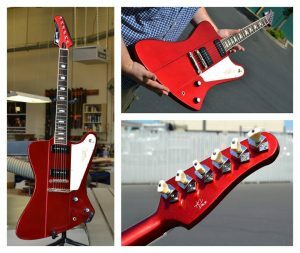 What is your best tip for people looking to get into the guitar building business? Find a spouse that loves you and has a real job. It REALLY helps. It also helps if you are creative. While there are plenty of people who are successful doing refined versions of classics, doing original work means you have no competition. People either like what you make, or they don’t but if they do, you’re the only source for it. That, and be ready to work every living moment of every day. Even if you aren’t in the shop making things you are still tied to email, phone, Twitter, Instagram, etc. all day. It’s part of the business. What is your best-selling guitar? The best model historically is probably our Banshee. We have more total Daylighter guitars, but it’s spread over several variants of it. Banshee has been a mainstay for us for years. What was the most challenging part about building your first instrument? Everything!! I was lucky to learn fret work and some other basics from my father-in-law who had experience doing it (and woodwork for my own father). I’d say to this day fit and finish is still the overall most difficult part of any guitar building. What do you think is the most important quality in a good luthier? Attention to detail really helps. Good design sense and creativity. Good ears aren’t a bad thing either! What is the biggest hurdle you’ve had to overcome as a builder? From a business perspective, it’s always worrying about when the next paycheck is going to come in. I have three employees, so cash flow is always my business worry. As a luthier every aspect can be challenging. Paint was particularly difficult, not because painting itself is difficult but there are so many factors involved from weather, prep, technique and most importantly the actual finish material formulas themselves. Those sometimes change without much warning from the companies that make them! Why should people support your company? It’s hard to not sound like we’re bragging so I’ll leave it at this. I don’t have stock holders, I don’t have an expense account; every guitar we sell is made by the four of us here in our shop. We put our heart and souls into making the best guitar we can, and I think we do a great job at that. I love that many of our customers and artists have become genuine friends to myself over the years. Makes me feel like we’re doing the right things. Be sure to hop on over to Kauer Guitars and its dedicated offshoots, Titan Guitars and DRS Racks, and support America’s finest guitar makers. 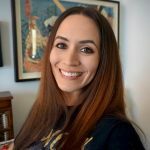 Monique Hernandez-Fuentes writes for GuitarTricks.com, the #1 website for online guitar lessons. Wow this is really cool!! Nice blog! !